Geeks in Love: Real Life Portrayed in Comics | "I'm Not The Artist"
Geeks in Love at 2010’s SacAnime Convention. Sarah and Beau Straub of Geeks in Love are comic couple based out of Northern California. This webcomic, as drawn by Sarah, revolves around actual conversations and incidents that happen to this married couple of six years. In the year-and-a-half they’ve been exhibiting, Beau has often been confused as the artist— another subject that has been a topic of a recent strip. What is Sarah working on now? Right now Sarah is working on transitioning her storybook-like illustrated art style into comics. Her first project is a series of comics adapted from Greek myth which she’ll be collecting into an anthology titled “Blind Follies.” The first issue will be a short based on Narcissus but with a bit of a Gothic-Horror spin. The second installment will be a two-part telling of the story of Eros and Psyche (known to the Romans as Cupid and Psyche). Which conventions do you regularly attend? What is your role? To what degree do you provide creative input? I’m a combination manager and sherpa. I take care of convention registration and other logistics such as food, hotel and transportation as well as being our pack mule. Creative input-wise, I provide the occasional opinion or suggestion and help Sarah work through layouts or scripts when something doesn’t strike her as quite right. I make a lot of random jokes and comments and those are the basis for many of the Geeks in Love strips. Do you attend every convention Sarah does? So far yes, and I hope to continue to in the future. However, as we do more conventions further away from home I may not be able to make as many of those. How often do people confuse you as the artist? How do they react when they find out you’re not the artist? Pretty often, or at least often enough that we made a Geeks in Love strip about it (see above). In fact, our friends will often approach the table and compliment me on the art just to razz Sarah. Usually they politely apologize or get very excited when they meet the real artist and find that she’s a female which is still a bit unusual in this field. Are you both always manning the table? Almost always, from time to time one of us will just take break to stretch our legs, grab a snack, or maybe attend a specific panel. Are you equally comfortable pitching the product? Yes, absolutely; we’re both talkers and we’ll find ourselves talking to Con-goers visiting our table about any number of different things from Sarah’s inspirations to her creative process to movies, comics and food. I love my wife and I love her art so it’s something I love telling people about. Sarah’s driver’s license as drawn by Beau and a bonus robot. It’s given us another thing to combine our knowledge on and work toward a common goal. What do you do besides helping out at convention? Do you have a day job or other hobbies? My day job is as a computer technician. I do a lot of reading in my spare time and I’m slowly gearing up to do a little writing in addition to my wide array of obscure hobbies (beer brewing, studying Japanese sword arts). Are there any couples that you regularly see at conventions that you look up to? Rebecca and James Hicks of Little Vampires. In addition to the many parallels between us, they’re actually the ones who gave us a big push to start going to conventions and getting Sarah’s work out there. Also, David Petersen of Mouse Guard and his wife Julia, who are such a sweet couple and so willing to talk to crazy fans (like us) for far longer than they probably ought to. What do you look toward most on the first day of any convention? Lunch! I like to try to find something unique to the area for us to eat. Sarah and I are self-proclaimed Hobbits so new and unusual food is definitely one of our favorite parts of traveling. 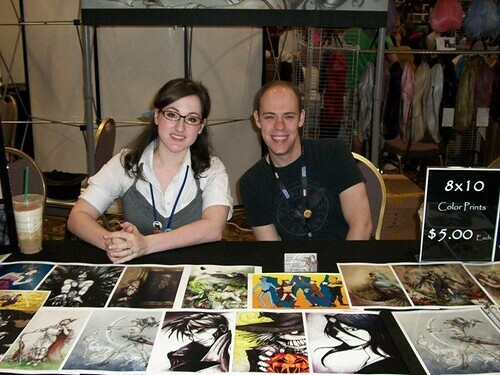 Is there one thing you absolutely dread working at comic-cons? Not really; we thoroughly enjoy meeting people and making new friends at Cons but I suppose the least enjoyable part is usually getting our badges amidst the commotion and confusion during the setup phase of a Con. What advice would you give other couples that tour the comic-con circuit? Don’t get discouraged. It’s not easy starting out but try to take notice of what things work and what things don’t and every Con will be better than the last.